For our third FIRST Robotics Competition season, we once again we joined with our great friends, FRC 122 the NASA Knights, at the regional. But this year we didn't go to the North Carolina Regional as previous years. This year we went to the Virginia Regional in Richmond. 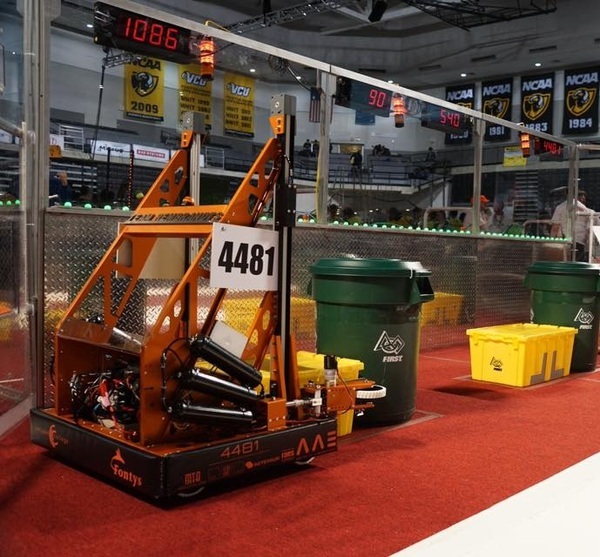 We didn't go alone to the regional, with the mentoring en help of us, team 5412, Impossible Robotics also joined us at the Virginia Regional 2015. Throughout the regional our robot and drive team grew better and better. We ended up with the highest ranking since the beginning of our team. With a ranking 6 out of 64, we were able to be a alliance captain. But team 540, TALON ask us to join their alliance.We accept their offer and together with Talon and team 1086, Blue Cheese we managed to get into the finals. In the semifinals we almost lost our chances for the finals. But with great teamwork and with luck we scored the regional high score. Unfortunately, after 3 very excited final match we came second. During the award ceremony we were honored with the Engineering Inspiration Award and the Finalist Award. In the end our whole alliance got qualified for the 2015 FIRST Championship. Check our day to day activities below and enjoy. We flew on Monday from Amsterdam to Baltimore, and with a bus we drove to Richmond. After arriving at the hotel, we made a small walk through Richmond whereupon we went straight to bed. Everyone was exhausted after a very long day of travelling. After a year of hard work we are back once again! Tuesday and Wednesday are reserved for some sightseeing of Richmond, and of course preparing for the competition. We start the competition on Thursday with practice matches and inspections. Enjoy the photo’s from the first day! Our second day in Richmond began with a good night’s rest. We had breakfast and after that, we walked toward Richmond center for an ‘extensive’ sightseeing trip by foot. During this tour we decided to satisfy our game ‘jitters’ by taking a sneak peek inside of the VCU stadium. When the evening fell we went for a nice meal at a local barbecue restaurant. Here we were joint by a few close friends from the Nasa Knights. They mean a lot to us since they are the ones who originally came to the Netherlands and motivated Ron to start Team Rembrandts. We would like to thank you for joining us. The team had a blast meeting you. We ended the evening with a good old fashioned game of arm and thumb wrestling! What a day, What a day! Day three already! With the Qualifying matches coming up in two days the team members are hyped! After an early breakfast we quickly organized and started meetings for the different tasks at game days. When the meetings were done the team quickly went out for a bite, since there still where a couple surprises for day three! Returned from the lunch and after a little break we started a teambuilding session. The team did a couple of simple games to stimulate the communication, with lots of laughter of course! The first game however, was played without verbal communication. The goal of the game was to make a circle with team members and sort these from youngest to oldest. After a bit of struggle and a lot of fun these games where finished. After diner we went back to the hotel and came together with the FRC Team 122 NASA Knights and Impossible Robotics. After a short introduction Team Rembrandts had a couple surprises for Ron as well. It doesn’t happen a lot, but this time Ron was speechless. A couple of small chats later it was time to end the day so that everybody was ready for practice day! Thursday practice day! Just as the VCU opened at 8:30 AM we walked right in! Before the practice matches started, the drivers had to attend a drivers meeting to discuss the rules. The day had a total of three practice matches planned for Team Rembrandts. Unfortunately, when the first match started our robot wasn't match ready yet, but both of the other matches were played! After a long day of practice and scouting, the whole team went out for pizza. Back at the hotel the team quickly evaluated the day and immediately discussed all the tasks of the upcoming qualifying match day! Day 5 of the trip meant it was time for the first day of qualifiers at the VCU Regional. We started the day with teaching the American teams some known Dutch songs. Luckily Blue Cheese Robotics Team 1086 was kind enough to join us in the chanter. Take a look at these great pictures. We got the great opportunity to sing the Wilhelmus, our national anthem, for an audience bigger than 5000 people. This was a great honor for which we would like to thank the Virginia FIRST organisation. Finally we had the first five qualifier matches. Despite starting of bad in the first match with only eleven points we managed to climb the rankings finishing of the day with the tenth rank. Today we have our last qualifications matches. We ended up with a ranking of 6 and an average qualification score of 58,75. During the alliance picking we were ask to join the alliance of team Talon 540. Together with Blue Cheese 1086 and Talon we played the quarter finals. We managed to get through the quarter finals, but with our first semifinal match is went wrong. Robot lost connection with the field and stack of tote were knock over. Changes that we could get back in the race were small, but then we played our second semifinal match and everything went perfect. We scored the regional high score with our 155 points. Now we were back in the race for a place in the finals. The last semifinal match was nerve-racking and very exciting. In the end we just manage to win the match and place our self in the finals. After 3 great final matches we unfortunately lost. We were so happy with our second place and the experience of the whole regional. During the award ceremony we were awarded the Regional Engineering Inspiration Award en Regional Finalists Award. Thanks the Regional Engineering Inspiration Award we were qualified for the FIRST Championship 2015. Even or other alliance partners managed to get qualified for the Championship. So, we will see them again during the FIRST Championship in St. Louis. Before we went back to the Netherlands we first made a stop in Washington DC and visit some beautiful monuments and building as you can see in the video below.